I made a little bracelet from some fabric scraps and wanted to share it so, here is a little tutorial. Take three strips about 12inches long mine are of shirt fabric. Rather than cut the fabric rip it into strips for a nice rag edge. Use a large dressmaking pin to secure the 3 ends together onto something solid, I used the wingback chair in my workshop, you could use the sofa arm or ironing board cover if its sturdy. Braid the ends together making sure its quite tight. Keep going until you have the length you require mine is 6.5 inches long, I have quite a small wrist. Machine or hand stitch to secure all three ends together and cut away excess end strips. Sew a button over the edge covering the stitchline. Stitch a loop of elastic cord, whichhas been knotted, securely to the other end. Next embellish with a selection of small shirt buttons. Make sure the loop is not too tight or loose to go round the button at the other end and check that the bracelet is going to fit your wrist comfortably. Now your bracelet is ready to wear. ** This little tutorial is dedicated to my neice Bianca who died 1st April 2010. Below are some other little things which I made along the same idea. The bottom bracelet in the picture below uses the strip of fabric from a snap fasten shirt just leave them on the fabric and braid as normal you will find that they sit evenly along the braid. I couldnt resist making a couple from my pink floral fabrics and added a couple of vintage buttons. Below are a few hairbands I made. Cut the braid a longer length and stitch some wide elastic to the ends. The top blue one below has daisies secured with tiny yellow glass seed beads. The next one down, using a selection of Bianca's shirt fabrics and some more of the pink to make a rosette flower and two vintage buttons to secure to the band. The bottom one takes advantage of the snap fasteners, I used pieces of fabric with the opposite ends of the fasteners stitched to the underside of the rosettes to just snap them on, they can be swapped around. Below is a Rag charm bracelet. Made from a mix of black and white fabrics. The fabrics for this piece were a bit wider creating a chunckier bracelet. Embellishments of ribbons, glass beads and vintage buttons carry the black and white theme but I couldn't resist adding a little bit of colour. A little lace flower was stitched to the large fabric covered closure button. If you have been inspired to make a little rag bracelet, rag charm bracelet or rag hairband I would love to see it. If you post a picture to you blog it would be nice to link it back to the tutorial that inspired you to make it. Working some more on the machine embroidery sample at the weekend, I stitched around the flower on the pale blue background with a filler stitch in a pale green cotton space dyed thread. I came across a little charm pack of tissue silks which I had purchased some time ago in the drawer and decided I would have a go with them. There was quite a selection of colours so I opted to use a few different ones. I free stitched over these petal shapes but I think I over did it a bit and sat looking at the piece for quite a while before deciding that I didn't like it. I think it looks too busy! So I cut into it and removed some sections with my little embroidery scissors. I also outlined the leaves﻿ with a space dyed rayon cord. I'm not sure how to progress with this, perhaps I should work on the background a bit now. Not bad...this is as far as a got with it have taken a closer picture below to show the shimmery effect of the gray. I had just started adding on some yarn when I had to stop. My little Charlotte is coming down with a cold and is needing more of my time. Her naps in the afternoon have been shorter than usual leaving me little time to sew. I'm looking forward to spending more time on this piece now. ......luck seemed to follow Bianca around, she was forever finding things, valuables & money, winning scratch cards and raffle prizes, You know when you go to a fundraising event and you buy some tickets then you think, oh it's a good cause I'll buy some more , I might win something with all these tickets. Bianca was the person who would buy two and win two prizes. So I stitched the little lucky symbol just to remind me of those times, when she laughed at her luck and made others smile too....happy for her. I thought that stitching a clover would be simple but I stitched and snipped it out about four times before eventually opting to do a simple outline and filling it in with Prismacolour pencil ....it's not perfect I stitched in the evening using the sofa light and I didn't stick to the outline, but it doesn't matter I like it! and there is quite a lot of it! I have been stitching away in my little studio as much as I can at the moment, I'm loving being back in there more at the weekends and managing to catch sometime most days when Charlotte has her afternoon nap. Having a tidy up and going through my stash of fabrics, threads, beads and findings gathering inspiration along the way ... it's good! I have been playing around with new ideas and have taken some pictures which I hope to put together with a little tutorial , I hope to post it soon, need to take some more pictures tomorrow in the daylight. Hope you all had a happy Monday out there....mine was busy﻿! Whilst looking for a suitable sketchbook for a journal, these 3 little pieces fell out my sketchbook this morning. I hadn't even photographed them until today the date on them is 2008! I was just having a little play around with paint paper and my sewing machine, having been inspired by a Cloth paper scissors project by Kelli Perkins ~ Thread sketching October 2007 issue ......wasn't sure about them at the time but I think I quite like them. Two more squares have been stitched on the 28 squares embroidery. With the little patchwork mini~quilt complete I think I will get work done on this a bit more often now. The musical note which represents Bianca's love of music. The stripey background fabric is a little piece of Bianca's shirt. For a few days following her death, many of us has vivid dreams, her sister Adele kept seeing Bianca's childhood trike in her dreams, "it just keeps appearing in my dreams" she said "its so vivid, bright red, just as I remember it"
I made this in June, finished just before we went on holiday to Crete and didn't get time to blog about it or even take pictures of it before today. A beach bag made from a pair of Bianca's jeans, something to remember her by. I moved the pockets out of the way before adding the applique rose detail so that I would still be able to use them. I removed the stud buttons from the back pockets as one was badly bent and was coming off anyway, and I stitched on some Velcro over the holes and underside of the flaps & a couple of large vintage Lucite buttons to compliment the colours of the rose fabric. I lined the inside with pink cotton as I didn't have enough of the rose fabric. The﻿ base is made from the other part of the jeans leg & handle was made from the other leg cut into strips and lined with the rose fabric. I also had to remove and restitch the front belt loops wider apart to get them in line with the back ones & allow the handle sit right. They are soft and comfortable to wear even when the bag if full. I'm quite pleased with my beach bag, I keep it packed and ready for swimming, it holds four towels and everyones' swimming attire ready to go........ I think Bianca would have smiled & laughed if she had seen what I did with her jeans it would have amused her to see how much it can hold. It did us proud on our holiday. It's being delivered tomorrow. I'm quite excited about it. 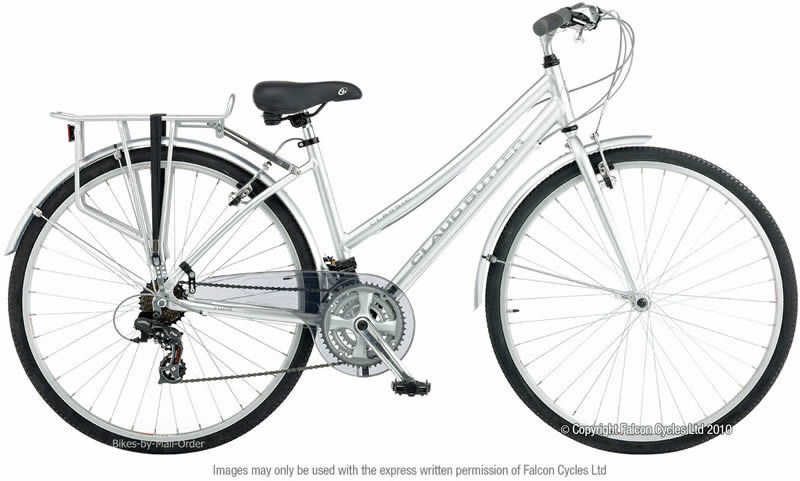 Also ordered a front seat and helmet for Charlotte. Hope it fits! Back in June I posted about having a clear out in my workshop getting ready for change and never got back to posting the pictures I have taken. This is my Jewellers bench, a birthday gift from Kevin Last year which for a couple of reasons has sat unused. However its up and running now and I enjoyed working on the first little piece to be sawn, hammered, soldered, pickled, stone set and polished on it! It has been so long since I had worked with silver I was so out of practice. I need more days of playing around at my bench. Here are some pictures of some of the silver work I did at college. I have never shown these pieces on my blog before. 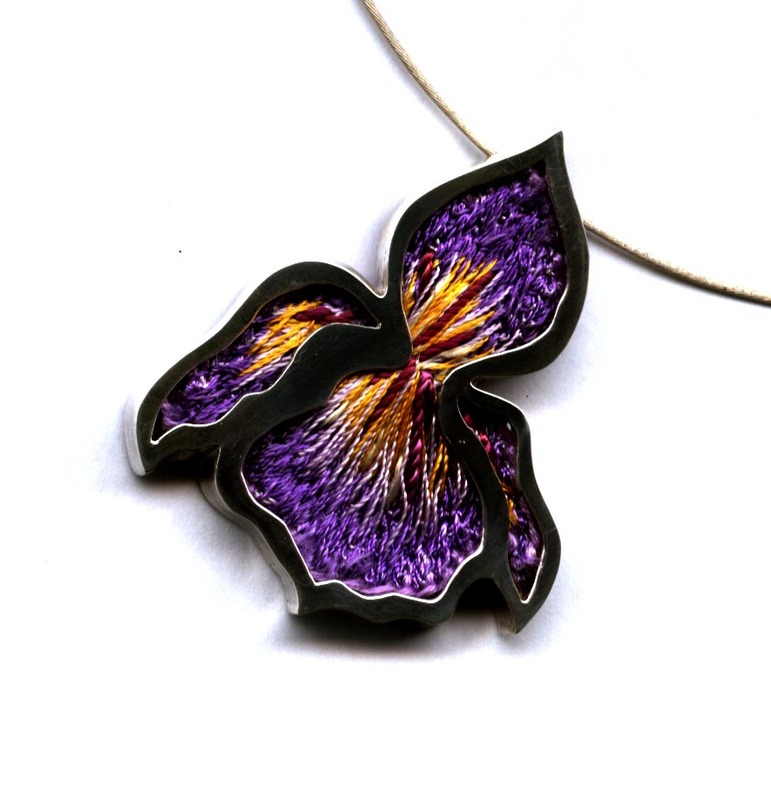 Iris pendant which is hand made in silver with a silk hand embroidered insert. Iris brooch which has a machine embroidered insert. 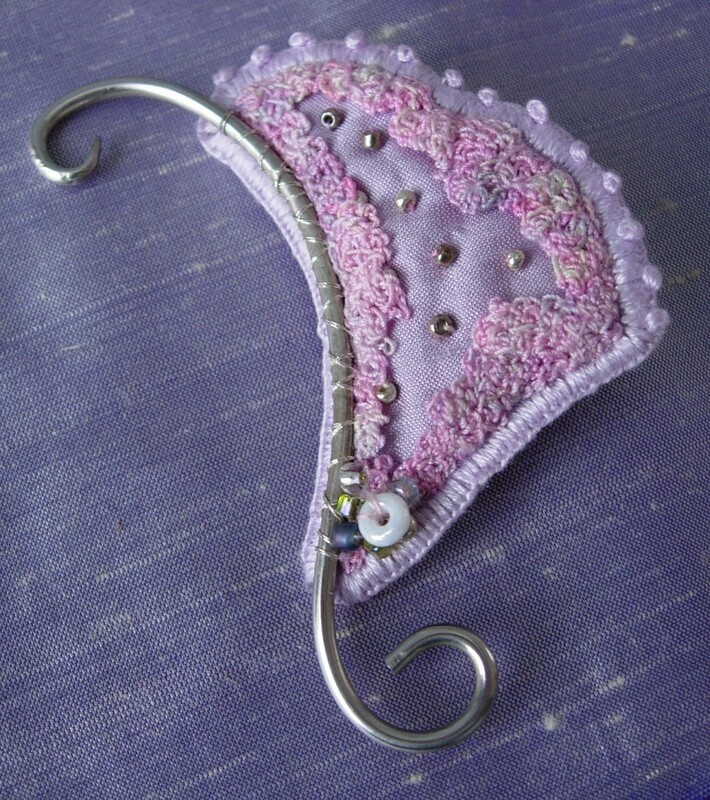 Silver swirl brooch with silk fabric and machine embroidery on soluble fabric & added beads. As you can see I really enjoyed mixing the silver with the textile I'm hoping to do more of this sort of thing again now that my jewellers bench is up and running. I forgot to post a picture of the bunting set I did for a friend. She was looking for a baby gift for twins and thought my bunting banners were a perfect idea as the baby's has unusual names. It's not the best picture, it was taken in a rush before getting them to her before we went on holiday I will post better individual ones on Flickr﻿ in the Banner album for those who want to take a closer look. I'm feeling quite pleased with myself today. I have finished the quilt top after many hours of sewing yesterday at my sisters. We sometimes get together for a sewing day at each others house. I didn't take Charlotte with me so I was able to get about 30 pieces sewn on. Today I added the last 5. This is how it looks. I know its not very exciting or arty looking but it's still an achievement for me to get this piece to this stage. 229 Hexagons all stitched together by hand. Having had a bit of clear out in my workshop with a lot of projects in mind to I came across a pile of unfinished projects which I really have put off for way too long. I have saved some of Charlotte's pretty dress and baby things which I plan to make into a quilt. And my sister Theresa gave me a beautiful bundle of fat quarters in black and white prints for my birthday which I also have plans for a quilt. I realised that I couldn't possibly begin any of these two projects before completing two I started a few years ago I don't know exactly how long ago I started them but I haven't worked on either for at least 12 years.......yes I know such a long time and I feel bad for leaving them so long. for my daughter April who is now 18 yrs old. I started this quilt when she was about 3yrs old. It began from a pack of Laura Ashley patchwork pieces. I then incorporated some peach floral fabric which I liked and some aqua white spot fabric. I think I stopped working on this when I ran out of both fabrics. Quite reciently I found some more of the aqua & white spot fabric in the remnent bin at Rejects. I used it for the leaves and bird on the swing crib drapes I made back in February 2009 for Charlotte. Im so glad I got lots more I think it was only a couple of pounds for about 3 mtrs. Im quite enjoying the slow process of hand stitching each piece together. I had forgotton how theraputic it can be, making up batches of the paper backed pieces then adding them to the quilt, watching it grow. It also gives me time to think about how I'm going to back this, or what I'm going to back it with. Im enjoying my return to this too long forgotton quilt. Two fun little shoe coasters, made from denim and pink cotton. Just having a little fun time on my sewing machine. .. just noticed the eyelet stitch option, never noticed it before. I forgot to take a picture of the back which is deep red floral fabric. I really enjoyed working on this little piece which has all been done by hand. Not sure whether to hang it as is, frame it or keep it until I have made all the other pieces from the book, although I have so many other projects on the go that I'm not sure how long it will be before I begin another panel from the book. I have decided that I'm going to resist the temptation to start any new project until all the ones I have already started are complete. This one was the first.